This machine is uitable for hemming bottom of tubular goods, such as T-shirts, polo shirt, and etc (thin & medium-thick fabrics). 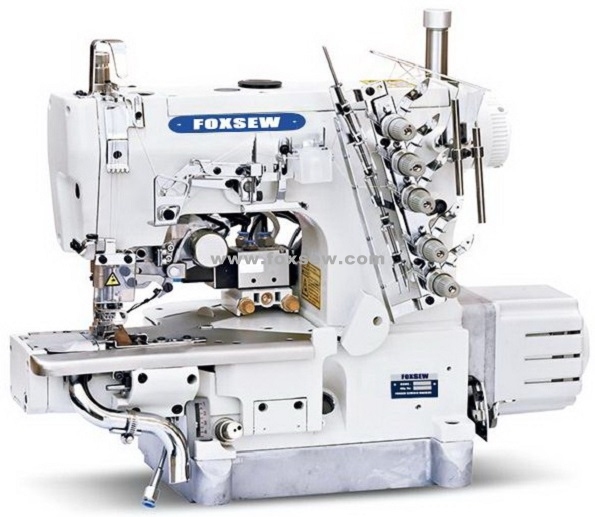 The left side trimmer equipment enables hemming and trimming at the same time, ensures even selvedge, and assures higher working efficiency, lower cost and elegant products. leisure suits and sports wear, for light and medium materials. 1) This machine adopt hemming model, with left edge cutter device and waste absorb tube. When cutting the edge of the cloth, the waste cloth can be absorbed from the tube. 2) Suitable for enforcing the seaming of sports ware, T-shirt, under ware, children’ ware etc. 3) New type needle bar oil-back system, no possibility of oil leakage. 4) Needle bar transmission structure, adopt all-sealed design, more safe and easier to keep clean. 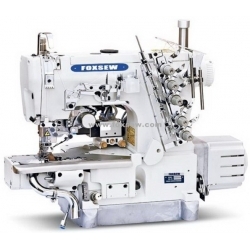 5) Complete automatic supply system and oil-filter device, ensure the max sewing speed to be 6000r.p.m. 6) The circumference of sewing body is just 280mm, suitable for some small round parts such as collar and sleeve etc.